Daily Rehearsal: Is it a comedy exodus if just one comic leaves? 1. Zanies highlights for May and June: John Roy, Larry Reeb, Pat McGann, Dobie Maxwell, Mike Vecchione, Tim Walkoe, Fortune Feimster and Andy Woodhull. 2. John Conroy was on the Afternoon Shift yesterday, talking about being a journalist-turned-playwright. 3. If you are a huge Jane Austen fan, or have a desire to date educated women, head to Lifeline&apos;s 29th Anniversary Benefit, entitled “An Austen Soiree: Readings, Music and Games of Jane’s World.” "It&apos;s an evening that captures the spirit of Jane Austen&apos;s world, in a setting reminiscent of a Regency country house. Ladies and gentlemen of the time will be in attendance, as guests enjoy games, dancing and music of the period. There will be Regency-inspired dining as well as delectable wines, small beers and fine whiskeys. Also command performances from favorite Austen novels, an exciting live auction and our Speculation Raffle. It’s an evening of fun for Janeites and Non-Janeites alike. And all for a very good cause." Wednesday June 6 at the Woman&apos;s Club of Evanston. There&apos;s also a raffle. 4. 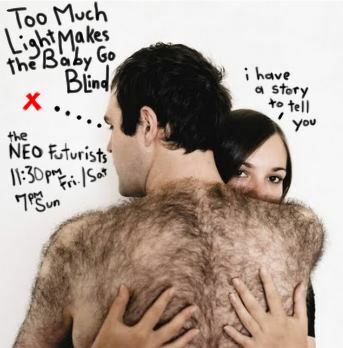 This poster for Too Much Light is really kind of creepy but I want to know more? So, all in all, effective strategy. "They were saying: &apos;I hope that means there will be more of a focus on Chicago comedy,&apos; and that’s not true. Tha’s [sic] what makes stand-ups who have come out of here so great, nobody has paid any attention to them, they’ve had to demand attention and get good. It’s perfect here, a little bit. It’s frustrating. It doesn’t feel good all the time, but it’s like the perfect temperature."